Hello people of the Internet, have you been thinking about splurging on a Dyson vacuum but were like, "I'd love one of these, but gosh darn, $400 is just way too much for a household appliance?" Do not fret! Because right now, you can get a certified refurbished Dyson V6 or V7 Motorhead vacuum for only $179.99 or $219.99 on Groupon!!! They're normally $299.99–$399.99 at full price. Plus, you get an EXTRA $20–$30 off at checkout. This deal only runs until 8/24! I recently picked one of these up myself to see what all the hype was about and lemme tell you: it's freakin' AMAZING, especially if you have a smaller home. Just a couple of years ago I would have scoffed at the idea of buying a "designer" vacuum — but having recently seen the genuine difference a good vacuum can make, I decided to make the splurge. I upgraded from one of those small corded handheld vacuums that cost less than $40, which I absolutely hated — I had to crouch down to get into the nooks and crannies, and I never felt like I was doing a thorough job. I had heard good things about Dyson vacuums and read some stellar reviews online, so I went to test them out in store. I was initially a little bit skeptical about a cordless vacuum, since there's a cap on the running time. I ran the V7 Motorhead over a dirty carpet in the store, and it cleaned it very effectively. I also tested a few more expensive models like the V8 and V10 (which were both more powerful and had longer running times), as well as cheaper models by other brands and ultimately decided that the V7 Motorhead would be the best option for my budget and space. The V7 has all the attachments I needed, including a crevice tool for sucking up hairs and a combo tool for furniture and upholstery. It only runs for 30 minutes at a time, but I never really vacuum for that long anyway since my apartment is so small. 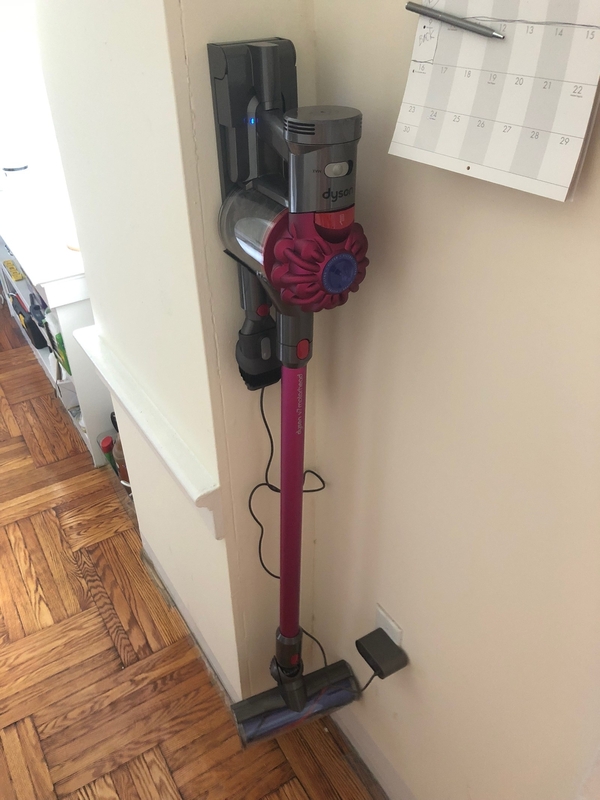 Dyson also offers a pretty comprehensive warranty and solid customer support service (you can even get free preventative maintenance checks at a Dyson Service Center), so I felt confident about my purchase. Once I brought it home, I mounted the charging/docking station to a wall, which ended up saving me lots of space. I found it to be more than powerful enough for my hardwood floors, and it even ran smoothly over a thick and shaggy rug in my living area. Because I didn't have to crouch down anymore, I became more motivated to vacuum up hairs and dustbunnies from under the desk and around the sink. The vacuum itself isn't too loud and actually makes the chore feel a little less tedious. My floors have never been so clean, and now I actually (semi-)enjoy vacuuming. For me, it was 100% worth the investment! Get a Dyson V6 Motorhead from Groupon for $179.99 or a Dyson V7 Motorhead for $219.99 (originally $299.99 and $399.99). These units are certified refurbished. Or, if you prefer a new unit, Dyson V7 Motorhead vacuums are also on sale at Amazon or Walmart for $247.79. Dyson V6 Motorhead vacuums are on sale at Amazon and Target for $249.99.